Do you know the health benefits of the canola crop you grow? The chart below can be used by registered dietitian, health professionals, chefs and consumers when comparing different types of cooking oils. Canola Oil is a Good Fat. Your body needs fat – to keep you warm, provide energy and help you absorb fat-soluble vitamins and caroteniods. But some fats are healthier for you that others. Canola oil provides more of the good fats than any other popular vegetable oil. Essential good fats – canola oil is high. Fats are made up of smaller units called fatty acids. Two fatty acids are essential in your diet because your body can’t make them. Alpha-linolenic acid (ALA) is an essential omega-3 fatty acid and linoleic acid (LA) is an essential omega-6 fatty acid. Both of these good fatty acids are polyunsaturated. Canola oil is a good source of the ALA omega-3 fatty acid and its ratio of 2:1 of omega-6 to omega-3 is nutritionally ideal. Omega-3 fatty acids protect against heart attacks and strokes by helping to lower bad cholesterol. Omega-6 fatty acid is important for the brain and essential for the growth and development of infants. Canola oil contains very high levels of heart-healthy monounsaturated fatty acids too. Monounsaturated fat lowers bad cholesterol (LDL) and helps control blood glucose. 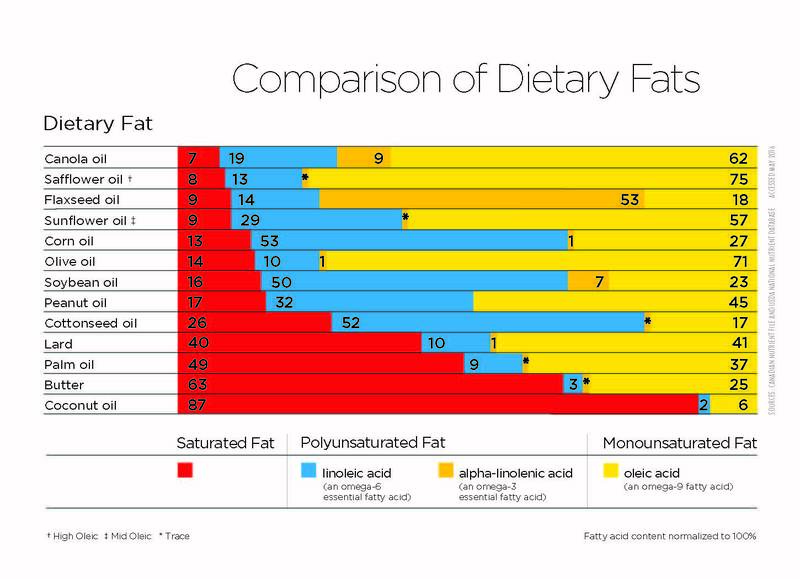 Bad fats – canola oil is low. Saturated and trans fats are “bad”. Saturated fats raise the bad cholesterol (LDL) in your body and have been linked to coronary heart disease. 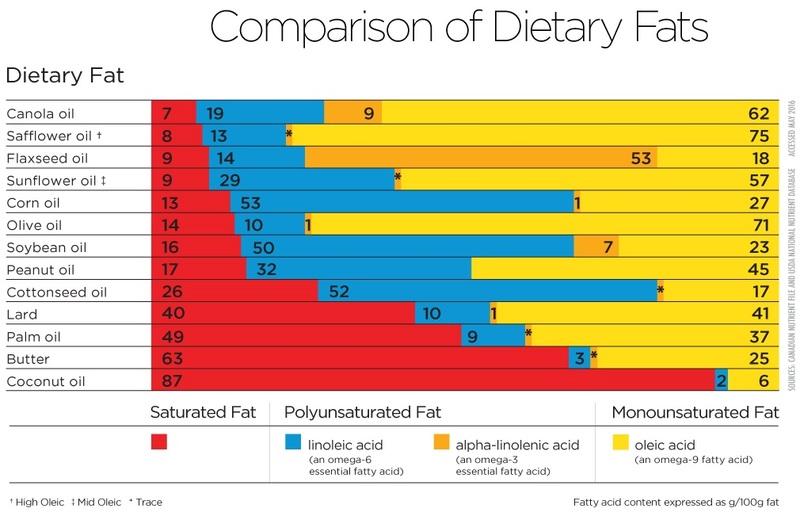 Canola oil has the lowest saturated fat level of all vegetable oils. Olive oil contains twice as much saturated fat as canola oil. Trans fats raise bad cholesterol and lower good cholesterol (HDL). While all processed oils contain very small levels of trans fatty acids, North American government regulatory authorities define canola oil as zero trans fat. Partially hydrogenating vegetable oils to make them more solid also increases trans fats. Be wise: choose canola oil and non-hydrogenated soft margarines instead of solid fats such as partially hydrogenated margarine, shortening, lard and butter. Canola oil contains no cholesterol. cholesterol that you eat in animal products such as eggs, meat, poultry, fish, dairy products, butter and lard. Canola oil is cholesterol-free. Canola oil is a good source of the antioxidant vitamin E.
One serving of canola oil each day will deliver about a quarter of all the vitamin E you need to protect your body’s fats and proteins from free radical damage. Vitamin E may also help reduce the risk of heart disease, cancer and memory loss. Canola oil provides the best nutritional balance of all popular cooking oils. Canola oil is made from canola. Canola oil is pressed from tiny canola seeds produced by beautiful yellow flowering plants of the Brassica family. Cabbages and cauliflower are also part of the same botanical family! Canola was bred naturally from its parent rapeseed in the early 1970’s. It is NOT rapeseed. Their nutritional profiles are different. Canola has GRAS status; rapeseed does not. Canola oil is light and clear and has a mild flavor that lets spices and herbs shine through in vinaigrettes. It enhances the delicate taste of baked goods. It delivers and seals in marinade flavors and its high smoke point makes it ideal for sauteing and deep frying.